Here’s how to go through the list of things to check. N.B. In the guide below, the term “mothership” refers to the site that your UpdraftCentral dashboard is running on – which is updraftplus.com if you are using our managed dashboard. 1.Is the remote site online? To check the remote site is online, attempt to access its WP Admin page via your browser. If you cannot access the site directly, then you will need to fix the remote site before it can be connected to remotely. UpdraftCentral is a remote-control device for sending commands to your WordPress site. But, if your WordPress site is not up, then the message can’t get through. 2. Is remote control installed and enabled? Check if the remote site still has the correct authentication key. Go to the controlled site’s UpdraftPlus settings page. There, go to the the Advanced Tools tab. Under the UpdraftCentral (Remote Control) section, check that there is a key that was sent to the dashboard present. If not, you will need to re-connect the site, as shown in this guide. 3. Is the site firewalled, or has other access restricitons? Firewalls can block the connection to the remote site. This firewall can be on either the Mothership site’s server (i.e. the site that hosts your dashboard) and blocking outgoing connections, or on the Remote site’s server and blocking incoming connections. Or, you might have some other sort of authentication (e.g. webserver-level username/password) set up to restrict the ability to reach WordPress. You will have to ask your hosts/server admin for each site to investigate the firewall logs and identify where the connection is being blocked. They will then need to add the connection to the relevant white-list. If this is not possible, you can try connecting using one of the alternative connection methods. 4. Is a security module blocking the access? Security modules on the server and security plugins on the remote site can block the connection. They might see the incoming request from UpdraftCentral, and decide that it looks unusual, because it’s not a normal web browser asking for a web page. As a result, they might decide to block it. This could mean a WordPress security plugin (we have pro-actively tested the most common WordPress security plugins with their default setups, and are not aware of any clashes currently), or a module on your webserver. For security plugins installed on the remote site, check if it is possible to white-list the connection. You should be able to find details of the connection in the security plugin logs. Also, try de-activating the plugin and seeing if that makes a difference. In the case of server-side security modules (such as mod_security in Apache), you will need to ask your hosts to investigate, and allow the connection. For mod_security, if you manage your hosting via cPanel, it might be possible to de-activate it in there; but, you will need to ask your hosting company for guidance, as it’s not something that can be known from this end. To do this, follow this brief guide. (Short version: on the controlled site, go to UpdraftPlus -> Advanced Tools -> UpdraftCentral (Remote Control section), and click on the “fetch…” link). These logs will show any incoming commands, or errors, that occurred on the remote site’s side. If you are not sure what the error message means, or how to fix the issue, you can contact our support team via the Support form. Instructions on how to do this can be found here. Keep this console open when trying to add the site. If an error is occurring on the mothership side or in the browser, then they should be logged here. If you are not sure what the error message means, or how to fix the issue, you can Google for it – and if that doesn’t help, you can contact our support team via the Support form. If you go into the site configuration, and into the advanced options, then you can try changing to a different connection method. In particular, one that routes the connection via the mothership (i.e. 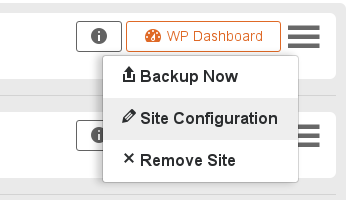 via updraftplus.com, for our hosted dashboard) may give you a better result, depending on what exactly the cause is. If none of the above helps, or if the connection cannot be white-listed, try connecting with a fresh key, using one of the alternative connection methods. Instructions on how to add a site can be found here.